Learn helpful hints about how the Lord speaks to you specifically! Helpful resources for training children to hear God's voice! "Growing Up With God is an emotionally intelligent and spiritually relevant story that equips youth of all ages to tap into God’s heart and hear His voice in their lives." "Eyes that See and Ears that Hear creatively gives parents the tools and language needed to help guide their children into God encounters. This six week course will set your family on a life-long journey of hearing God's voice together." "Arrows: Releasing Kingdom Children is a 13 week parenting video course designed to equip parents in raising their children to live a kingdom lifestyle." Helpful resources for training grownups to hear God's voice! "Basic Training for the Prophetic Ministry is a practical guide that has become a staple resource in training all believers to operate in prophetic ministry." 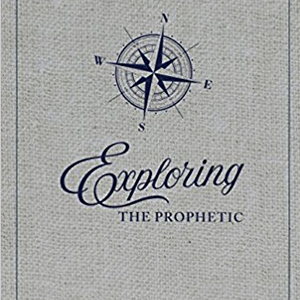 "Exploring the Prophetic is a 90-day thisdevotional full of fun challenges, scripture references, teaching points, and powerful activations to get you daily walking in the prophetic and hearing God's voice in impactful ways!" "Whisper introduces you to the seven love languages of God; each of them unique and entirely divine. ...By learning to tune in to and decipher each language, you’ll be able to hear His guidance in simple as well as life-altering choices." Helpful life group resources for learning to hear God's voice! The Prophetic 101 eCourse is an 8-week experience intended to grow you in a deeper understanding of prophecy and its application in your life today. Prophetic Personalities is an 8-week course that dives into four different ways God's wired us to hear Him. As you discover your specific prophetic blueprint, prepare to walk into deeper communion with Him. "Arrows: Releasing Kingdom Children is a 13-week parenting video class designed to equip parents in raising their children to live a kingdom lifestyle."